In a small projection room placed in the space of the exhibition the visitor can look at a very sophisticated application. 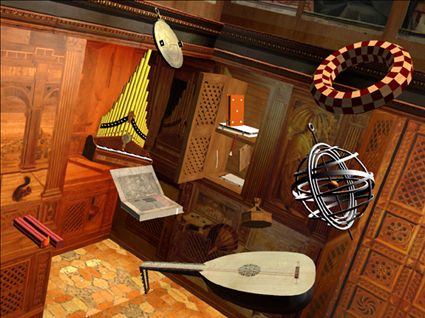 It shows with the aid of a computer, an interactive and multimedial virtual 3D reconstruction of the entire “Studiolo”: the fantastic small inlayed room located in the heart of Frederic’s Ducal Palace in Urbino. 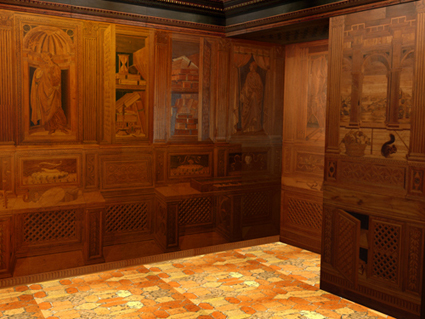 Like a “true” visitor, the reconstruction faithfully recreates the very atmosphere of Studiolo. Realized true to scale, the recreation allows us to move freely inside the “Studiolo”, and to observe with a zoom function any detail of this fascinating creation: from the wonderful inlayed decorations, to the pictorial cycle of Illustrious men and the polychrome ceiling adorned by symbols of Frederic’s war-enterprises. 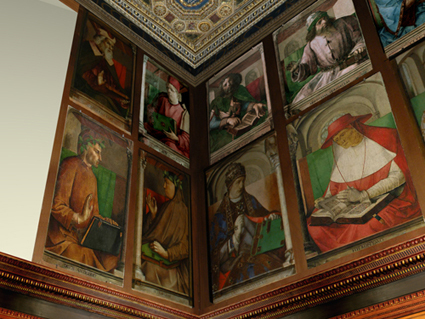 The 3D application also supplies with an idea of how the figurative cycle of the illustrious men appeared at the time of Federico: the 14 cuttlefish reproductions in the real Studiolo (the original paintings are preserved at the Louvre in Paris ) are replaced with the real color paintings. • A two shelf Cabinet containing books, objects and scientific instruments. In this cabinet are located many symbols of the quadrivium arts such as the armillary sphere, the astrolabe, the mazzocchio and the mathematical tablet. With this reconstruction it is possible to extract all the objects from the cabinet, rotating them at 360° also observing constructive details on surface. The application also allows the observer to move objects in the “Studiolo” around and suspend them in the air as in a zero gravity room. With the same technique we can also move and turn into the space of the room the famous glass rectangular-sheet that, which seems to be hanged (through a rope) on the top of an inlayed column located in the west wall of the Studiolo. • Other scientific instruments are reproduced in the intarsias as well as in the gallery of the illustrious men and these include a mechanical clock, hourglass, dividers, armillary sphere. The 3D model localizes all these objects in sensitive areas and they can be clicked with the mouse. By clicking on them, a three-dimensional and interactive reconstruction of the objects come out from intarsias. • Other objects can be examined such as the musical instruments reproduced in the inlayed walls as well as two musical scores. 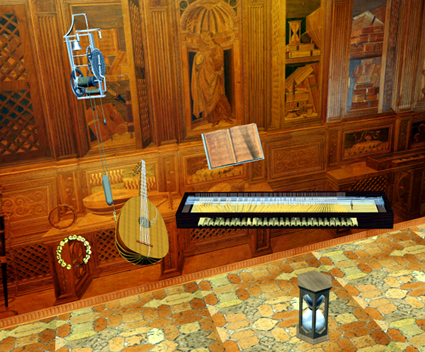 The musical instruments include lutes, an organ, clavichord and cymbal. By clicking on them, a three-dimensional and interactive reconstruction of the objects come out from intarsias. By clicking on the two musical scores, original musics engraved on the intarsias can be heard.